Jordan Romero arrives with supporters and family members at the Nepal-China border northwest of Kathmandu on May 26. Kathmandu, Nepal (CNN) -- The youngest person to climb the world's highest mountain has said age is no bar to following one's dreams and that he would encourage children even younger than himself to scale Everest. On Saturday Jordan Romero, from Big Bear, California, reached the peak of the 8,848-meter (29,028-foot) mountain aged 13 years, 10 months and 10 days accompanied by his father and stepmother. 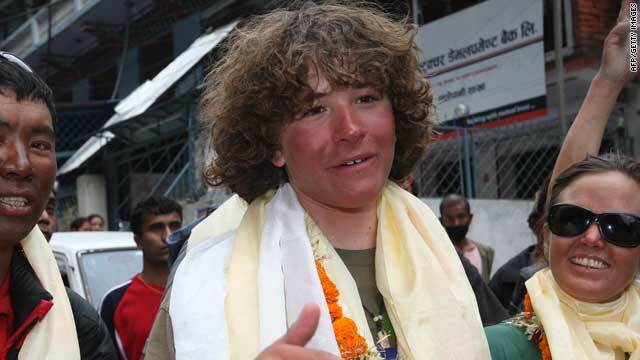 "Age is not a matter," Jordan told reporters in Kathmandu, a day after he returned from his climb. "My body did cope with the altitude very well." And he said he would encourage children younger even than him to reach the summit. "I definitely do encourage (them) to go big," he said. Jordan said he wanted his climb to inspire young people. "I am doing this to set an example for them," he added. The youngster has now climbed six of the "seven summits," the highest mountains of the seven continents; he plans to climb Vinson Massif in Antarctica in December. Before that he hopes to climb the 8,201-meter Cho Oyu, the sixth highest mountain in the world that lies on the Nepal-Tibet border, and descend on skis. He said he wanted to give the message that if one sets out to do anything, it is possible. He got the idea to climb the seven summits in 2004, when he saw a mural on the wall of his school. He climbed his first of the seven summits, Mount Kilimanjaro in Africa, aged 10, in 2006. He said the Everest climb was difficult and he didn't think he would reach the summit. "The altitude, the lack of oxygen made it difficult. Winds were blowing at 100 kilometers per hour and it was cold." I cried for an hour leading to the summit when we knew we were going to make it. As he approached the summit he said he was thinking of the weeks leading up to the final moment. "We knew this was the moment he had been waiting for," he said. Jordan was accompanied on his most recent climb by his father Paul Romero, a paramedic specializing in high altitude physiology and medicine, and stepmother Karen Lundgren. Three Nepali sherpas also reached the peak on 22 May. Asked how he felt when his son reached the summit Paul Romero said: "I cried for an hour leading to the summit when we knew we were going to make it," he said. "I was watching him getting stronger as he went up." The day before the summit the team left their camp at 7,500 meters at 5 p.m., and reached the summit 14 hours later. It took them another eight hours to get back to camp. Paul, also the leader of the expedition, attributed strong teamwork for their success. Because of strong winds climbers do not climb to the summit during the day. About 4,000 people have climbed Everest since Edmund Hillary of New Zealand and Sherpa Tenzing Norgay first climbed the mountain in 1953. The Romeros spent about 15 minutes at the summit, during which Jordan called his mother in the U.S. on a satellite phone. "I said, 'Mom, this is your son calling from the top of the world,'" an assured-looking Jordan told the news conference. Asked whether he had put his son in any danger, Paul, who's been on climbing expeditions around the world, said, "We had rehearsed every possible scenario. I know what calculated risks are." Despite his achievement, Jordan is trying to keep up with his schoolwork on the expedition. He is a week or two behind his middle school algebra assignment, he said, but is confident that he will catch up. He certainly has a good excuse.